Transform your look and get creative with the awesome effects of our brand new range of colourful body paints. Our awesome selection of body paint is perfect for creating your very own body art and you can enjoy a range of different eye catching finishes. The bright colours stand out wonderfully and they will put the finishing touches to any Halloween, fancy dress or theatrical costume. Whether you want to recreate the vibrant colours of your very own avatar or be unique and create your own style, these paints are for you. Each of our body paints are friendly to your skin and are easy to remove without leaving any colour staining or residue. Pick from bright colours and funky finishes for an artistic addition to your style. 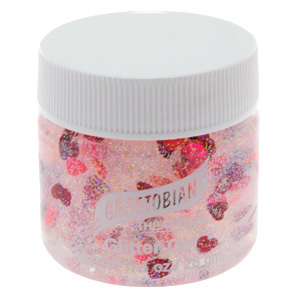 For that little extra boost our range of body glitter is perfect. It has a wonderfully sparkly finish that catches the light with a glamorous brightening effect. Below I have picked three of our glitter ranges that are perfect for finishing off any costume or look in style. Use your imagination and bring all your fantasy themed makeup to life with a touch of colourful sparkle. Glitter is perfect for nights out, clubbing and festivals as well as adding an extra dimension to any fairy or fantasy costume. Our aqua based glitter like the one to the bottom left has a fantastic fast drying effect with long lasting results. As it is water based it is ideal for using all over your body and even in your hair. Use the brush to finish intricate designs or cover larger areas in an instant. For a pretty girly finish we have a great selection of love heart gels like the one in the centre below. 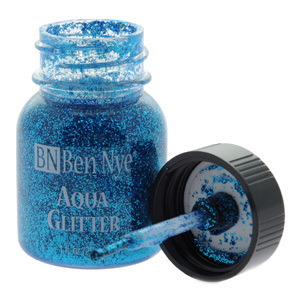 They feature a glittery gel that is perfect for giving your skin some sparkle. They also have a selection of larger heart shaped glitter pieces that are ideal for more detailed finishes. Place them at the top of your cheeks for a pretty finish to any makeup design, or over your body for a subtle eye catching look. 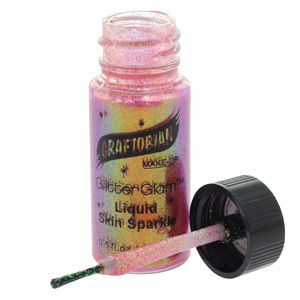 Another awesome addition is our liquid skin sparkler as it does exactly what it says on the tin. Cover your skin for a beautiful shimmering style or finish off a temporary tattoo for that extra head turning kick. The wide range of colours available makes them easy to match with any outfit, makeup or costume. Mix colours together for a pretty colourful finish every time. Each of our body glitters is easy to remove with warm soapy water and they have a fantastic long lasting finish that will last all night long! Our amazing range of latex body paint comes in a variety of vibrant colours perfect for creating attention grabbing finishes to your style. 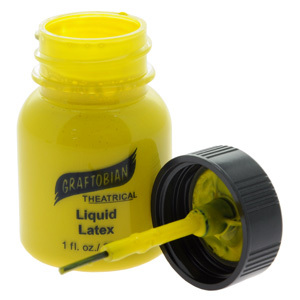 Latex body paint has a flexible rubbery finish that clings to your skin almost like a second skin. The opaque colours are ideal for creating full on body art but it is recommended to use them on areas of skin with little hair. It is also advised to use an aloe-vera gel or oil on areas of fine hair before applying. Be bold and create a funky colourful design that will get you standing out from the crowd. These paints come with a handy applicator brush, which allows you to create a range of different ideas from temporary tattoos to wacky designs and messages. They are perfect for Halloween, fancy dress costumes, festivals, theatre productions, nights out and pretty much anything you can think of. For a sparkling addition sprinkle with glitter when still wet and enjoy the twinkling effects you get when dry. As latex paint dries with a smooth rubbery finish it is flexible enough to cope with body movements and stays firmly in place. To remove you simply just peel the latex paint away and wash your skin with warm soapy water to rid of any lasting residue. Impress all your friends and be the center of attention with a variety of colours from our range of latex body paint. This entry was posted in Fashion Accessories, Theatrical Make Up and tagged aqua glitter, body glitter, body paint, glitter, glitter gel, halloween make up, halloween makeup, latex body paint, latex paint, make up, makeup, skin paint, tattoo paint, theatre make up, theatre makeup, theatrical make up, theatrical makeup on July 8, 2011 by Piercing Guru.